Anyway . . . after that terrible bit of nonsense we shall get back to small ships. In this first picture we have, from front to back, Dodd line steamer SS King Edgar, US Liberty Ship SS Jeremiah O'Brien, French transport Golo, and finaly Canadian pulp and paper carrier SS Corner Brook. The first model is a C in C "Doxford." It's a nice size ship that adds a little variety, but the casting is a little flat for my taste. The next two ships are Viking Forge castings of Seabattles originals; both quite excellent. Finally in the back is a casting I've not yet managed to identify. It came as part of job-lot. It feels rather like a nicer C in C ship, but I can't find one matching it in their catalog. No matter the original, it's a decent fit for Corner Brook. (Please do remember my merchant and auxiliary ships are often much more approximate than my warships. I research them and attempt accuracy, but there are times all I can find is dimensions or even just registry tonnage. My depictions should not be misconstrued as fact. They are gaming models to which I attempt to impart character through research and detailing.) Here's a closer shot of Corner Brook. If anyone can positively identify the model I would be grateful. Below is a much loved Texaco ship, SS Ohio. 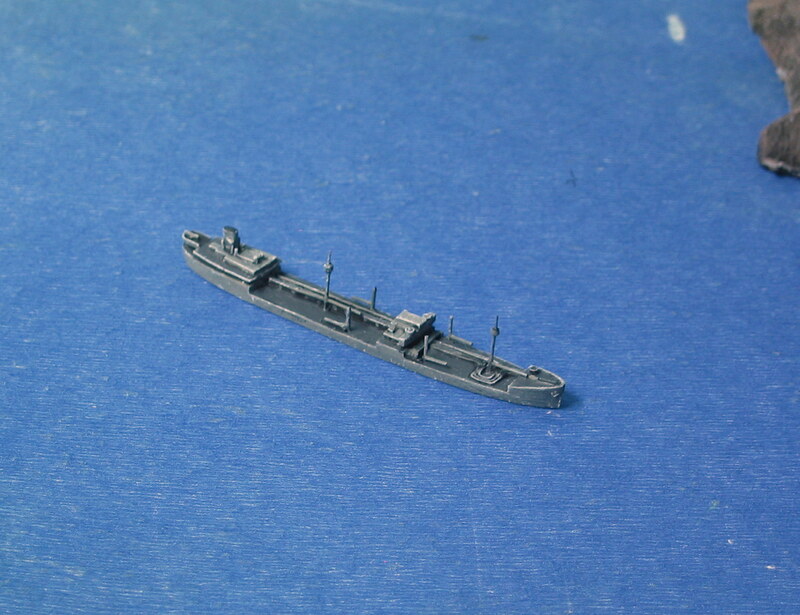 This model represents a rather more extensive conversion of a C in C T2 tanker. 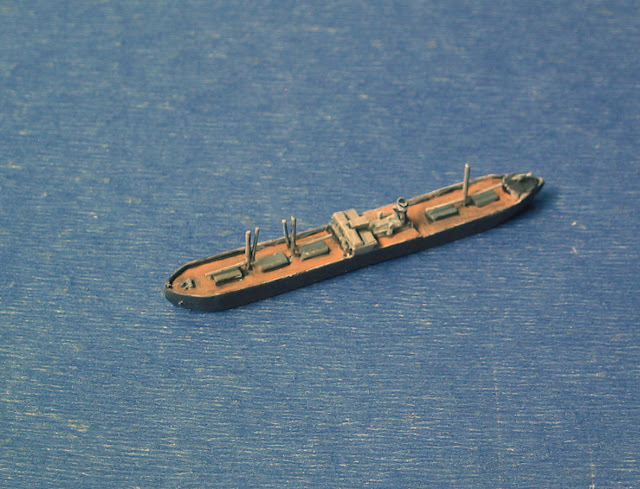 I had intended to show in progress photographs of this ship, but I seem to have inadvertently deleted them, so I will do my best to describe the process. I began by removing the catwalks, thinking Ohio had none. I later regretted this, as I found a good model that I believe to be accurate with a catwalk aft, thus I was obliged to fabricate a new one. Fortunately, this isn't a particularly difficult task. Lastly, since I don't have art of the above conversion, I'll discuss my conversion of AO-1 USS Kanawha, which was similarly extensive. 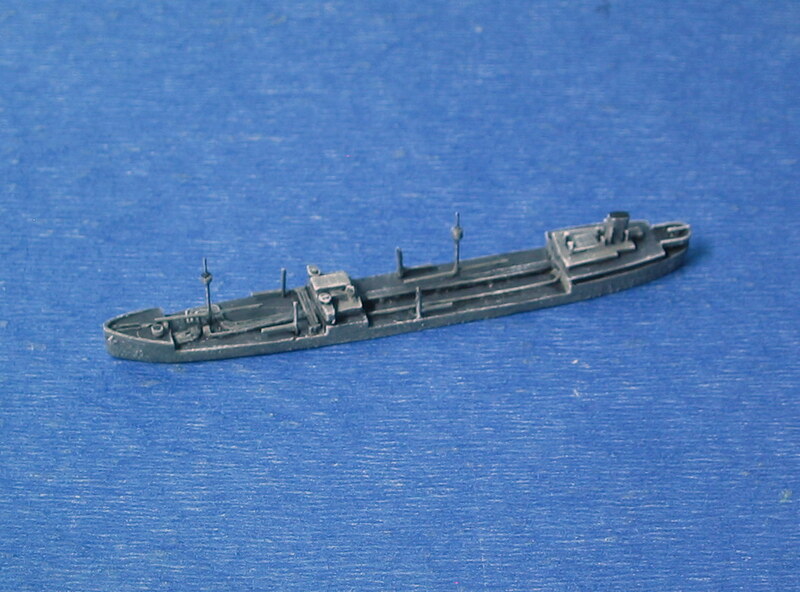 This ship began life as a Viking Forge model depicting her approximately as she appeared in WWI. Like most other ships that served in both wars she'd been extensively updated in the interim, so I stripped her almost down to the deck. I started by removing the aft portion of the catwalks and forward island, since these had both been replaced between the wars. I saved the island for re-use. It became the core of an enlarged amidships island. Next I built up the platform deck aft of this island. Since this is a rather rough casting without terribly much detail I elected not to completely strip the paint. In retrospect this was probably a mistake, but I can live with it. Here's how she eventually turned out. Not perfect, but not at all bad. Thank you! Coming from the author of such reports as yours I am humbled. Merci beaucoup.